From your first days as a nervous fresher, to finishing off your final project, the Brackenhurst Library will quickly become a home away from home. It’s a cutting-edge learning space and built with your needs in mind. So get comfy, and get working! Extensive resources, a range of study spaces, and award-winning customer service – what more could you need? Housing our collections on animal, agricultural and environmental studies, our library is a firm favourite with Brackenhurst’s students. You’ll find over 100 PCs here, plus laptops for loaning, and handily-placed power outlets for your own devices. Concentrate in quiet comfort, or work with your course-mates in one of our group study rooms. Whether you’re looking for a silent study space, or a decent spot to throw some ideas around, the Brackenhurst Library has got you covered. Most of our collections are accessible online. 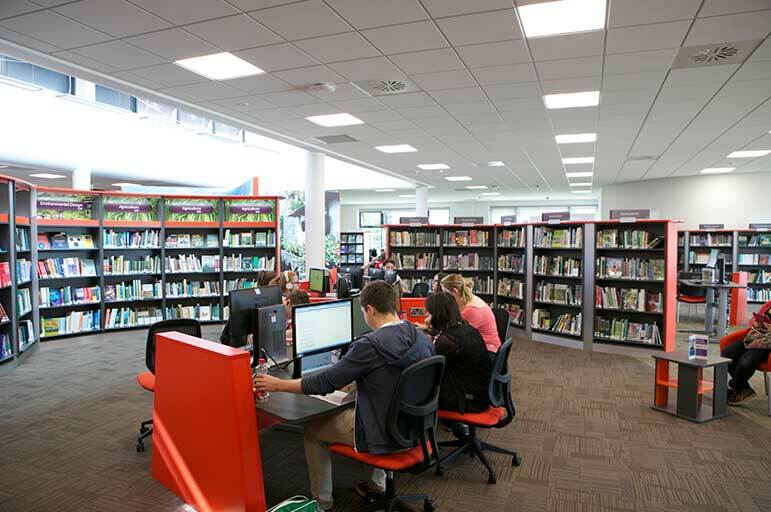 Visit our Library site, for more information on borrowing books, digital services, study support, postal loans, visitor access, and our inter-library arrangements. Our new award-winning BREAM library was built with your needs in mind – just like the Campus, it’s a peaceful space that helps you focus. But everyone needs a break from time to time. You can relax in our library social space or, alternatively, at Brackenhurst you only need to step outside. With a 200 hectare estate to explore, walled gardens, and a community of over 600 animals, it’s a one-off learning experience. Visit the Orangery for a hot drink, or the Brack Bar if you really need to relax!